Advice from nutritionist Carrie Dennett: Find a middle ground in your diet between rigidity and chaos. 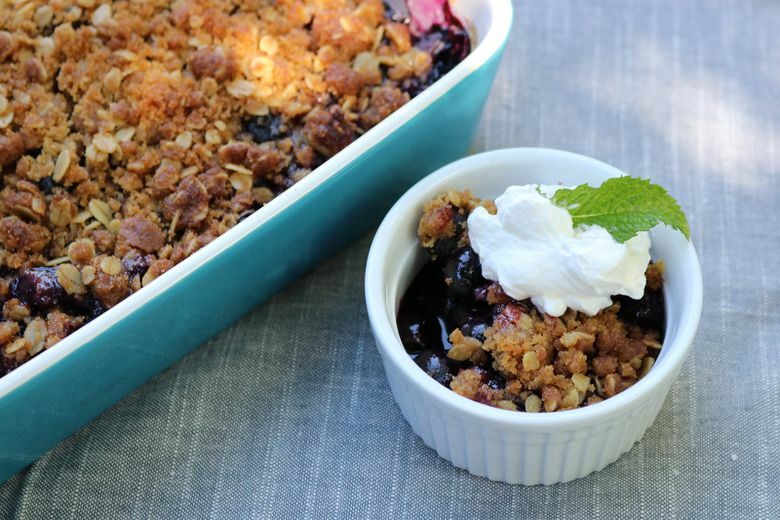 Eat your vegetables — and some blueberry crisp. Pick pretty much any religion or fad diet and you’ll find certain elements in common. Strict guidelines. The promise of personal transformation. But rigidity in your diet is not always the best option. In his 1825 book, “The Physiology of Taste,” Jean Anthelme Brillat-Savarin famously wrote, “Tell me what you eat, and I will tell you who you are.” In modern times, that saying has morphed into “You are what you eat.” Food is more than just fuel for our bodies — it has meaning and ritual, it evokes memories and emotions. Think of Sunday dinner (or Sunday brunch), think of holiday meals. In this way, food rightly becomes part of our identities, part of what makes us who we are. But what if we identify too strongly with how we eat? Just as there are differing religious ideologies, there are differing dietary ideologies, and in our increasingly secular society, our dietary beliefs can become as dogmatic as those of any religion. In his 2015 book “The Gluten Lie: And Other Myths About What You Eat,” religious scholar Alan Levinovitz, Ph.D., discusses how many of our food and nutrition beliefs are based on superstitions and magical thinking, leading to a faith-based view that’s more religion than science. Levinovitz points out that demonization of specific foods or food groups is cyclical, with some foods falling out of favor repeatedly over the centuries. Carbs, fat, meat, alcohol, MSG, gluten. This often leads to the belief that if excessive amounts of a certain food aren’t good for you that even a small amount is health-wrecking. Take sugar: yes, it’s a source of empty calories that, in excess, could contribute to health problems, but calling it “metabolic poison” or comparing it to cocaine? That’s a little over-the-top. Pick pretty much any religion or fad diet and you’ll find certain elements in common. Strict guidelines. Good and bad behaviors. The promise of personal transformation. The threat of temptation. Resist temptation and feel virtuous or even “pure.” Succumb to temptation and feel guilty because you’ve sinned. To seek absolution, you may confess your sins to fellow believers. A rigid eating plan is difficult to adhere to day after day. This can produce rigid one-track-mind thinking, because if you are working that hard, you want to believe it’s for a good reason. It can also lead to proselytizing — if you can convert others to your dietary bandwagon, this reinforces your beliefs and gives you a sense of belonging. Unfortunately, this can also alienate people. I have patients who tell me they avoid sharing meals with dieting friends or family members because hearing recitations of how many carbs or calories are in every food gets annoying, fast. As an antidote to Brillat-Savarin, I offer these sage words from the philosopher Epictetus, who was born in AD 55: “Preach not to others what they should eat, but eat as becomes you, and be silent.” Eat as becomes you. A novel idea, but a good one. The truth is that even ways of eating that have been shown through both time and scientific research to promote good health — such as the Mediterranean diet — have variability. The Mediterranean is a big area, after all, with many diverse food cultures. Similarly, what works for one person may not work for another. I follow with interest the research of Christopher Gardner, Ph.D., whose team at Stanford University is diving deep to find out why, when average weight loss on low-fat and low-carb diets is exactly the same, select individuals do really well on one or the other. If there’s no one right way to eat, why are so many people so rigid in their diet beliefs? Possibly because, as a newish country, we don’t have a strong traditional food culture, unless you count eating on the run. We also tend to be impulsive in our food choices, deciding what to have for dinner when standing in the grocery store at 6 p.m.
To eat as becomes you, to find a middle ground between rigidity and chaos, you have to learn to trust your instincts and inner wisdom more than you trust the latest headline or best-selling book. Draw from your own traditions, likes and dislikes. Expand your kitchen skills. Practice mindfulness. Eat your vegetables — and some dessert. This recipe is adapted from the 1997 edition of Deborah Madison’s “Vegetarian Cooking for Everyone.” Madison revised her James Beard Award-winning classic in 2014 as “The New Vegetarian Cooking for Everyone.” This comprehensive book, with more than 1,600 recipes, is a worthy addition to any cookbook shelf. 2. Combine topping ingredients in a bowl; mix with spoon or fork until combined and crumbly. 3. Mix blueberries with sugar and lemon zest. Pour into a 8- or 9-inch square pan. Cover with topping. 4. Bake until the berry juices are bubbly and the topping is nicely browned, about 60-70 minutes. Remove to a wire rack and allow to cool slightly. Serve warm.